A beloved dressage pony is breathing easier thanks to a new pulmonary function test developed at Indiana’s Purdue University. After lameness, respiratory-related health conditions are the most common cause of an equine athlete’s poor performance. Equine athletes require about 64 to 79 liters of air per second (compared to 4 in human athletes), and the slightest decline in intake can cause major problems in their performance. The new test identifies the most acute and elusive complications affecting a horse’s airways. It was developed by a team of researchers at Purdue, including Laurent Couëtil director of Purdue’s Equine Research Programs and Equine Sports Medicine Center. Couëtil began developing the Purdue-patented test after realizing the clinical need for a respiratory diagnosis system with assisted expiration (clinically referred to as “forced expiration”). “Many cases I see are suspected to have some condition related to respiratory disease or poor athletic performance, and the horses come here for further investigation,” Couëtil said. Dressage pony Love Bug was one of the first equines to benefit from the new test, after demonstrating difficulty in breathing, chronic coughing and a marked decrease in performance in 2017. Love Bug’s owner and rider, Hayley Jonkman, thought her mare’s competition days were running out. Love Bug’s cough had got so bad she couldn’t finish a lesson. For the test, a pneumotachometer (flowmeter) attached to a mask fitted around the nose is used to measure flow during normal breathing at rest. Esophageal pressure and airflow at the nose are used to calculate the change in pleural pressure, pulmonary resistance, and lung compliance. Forced expiration is used as part of advanced pulmonary function testing. The horse is sedated and fitted with an esophageal balloon and a nasotracheal tube inserted into the proximal third of the trachea. The horse’s lungs are manually inflated to capacity, and then the lungs are exposed to a vacuum reservoir to induce a forced expiration. From this, data is collected by a computer and forced vital capacity of the lungs, forced expiratory volume, and forced expiratory flow can be calculated and a flow-volume curve is made. The test revealed Love Bug had acute equine asthma. “Love Bug was really the perfect case to come here for our advanced respiratory testing and investigating while she was having the problem,” Couëtil said. “We were able to diagnose her with a mild form of horse asthma, and after the recommended treatment was implemented, her cough resolved within a week.” A month after treatment, Jonkman and Love Bug competed at a national event. 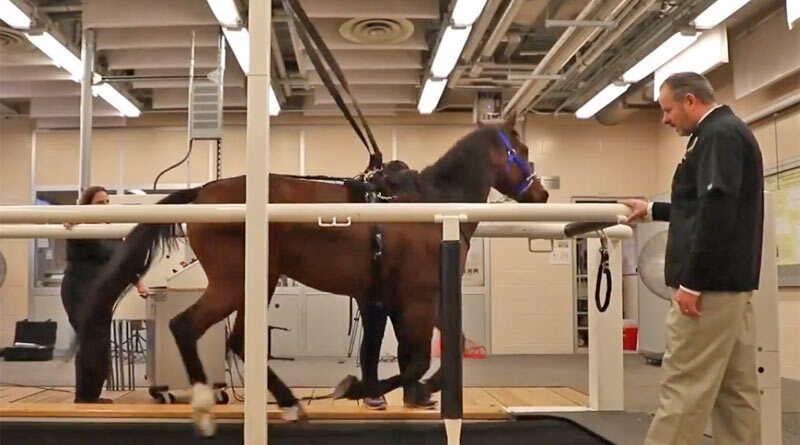 Dr Laurent Couëtil oversees a horse undertaking Purdue’s new pulmonary function test. The pulmonary function test is a tool unique to Couëtil’s laboratory. Because it requires specialized equipment and skills, no private practitioners have commercialized the technology. But Couëtil is exploring different variations on the diagnostic system, such as portability that might help private clinics use the technology. Couëtil’s work was inspired by a similar Purdue respiration research test for canines, developed by former Purdue professor Frank Rosenthal. The canine respiratory tool placed anesthetized patients in a chamber and remotely controlled air pressure to induce exhalation. Due to that tool’s success, Couëtil said, he made it his mission to develop a commercially viable alternative for equine veterinarians that required only mild sedation.